Our gift vouchers can be exchanged as full or part payment for any of our mountain bike skills courses, technique courses, skills weekends and guided rides. If you would like advice on how much to put on your voucher, please call us on 0333 121 2125. 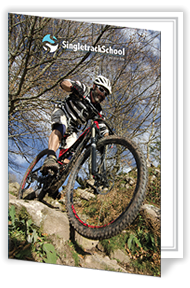 To buy a Singletrack School Gift Voucher please complete the form below or call us on 0333 121 2125. Please check if you have read and understood our Terms & Conditions. I would like to receive the Astounding Adventures newsletter. The company reserves the right to cancel gift vouchers at any time. Please also see our booking terms & conditions. Our gift vouchers can be bought in any amount above a minimum value of £30.00. Gift vouchers can be exchanged as full or part payment for any of our mountain bike skills courses, technique courses, skills weekends, guided rides and short breaks. They cannot be exchanged for cash or goods. Is there an expiry date? Yes. We put a twelve month expiry date on our vouchers. How quickly will it arrive? We'll send your gift vouchers by Royal Mail First Class Post on the day you order, so it's perfect for that last minute gift. Most people get their vouchers the very next day.